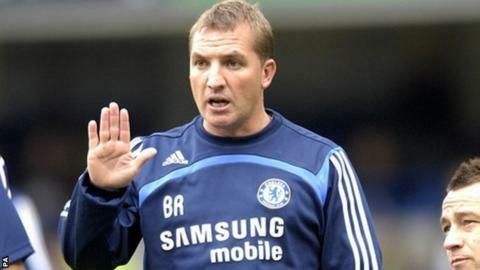 Real Madrid manager Jose Mourinho has backed ex-Chelsea colleague Brendan Rodgers to succeed as Liverpool boss. Rodgers, 39, was unveiled as Kenny Dalglish's successor on Friday after Liverpool and his club Swansea agreed a compensation deal. He worked as part of Mourinho's staff when he was in charge at Chelsea. "I am very happy with his appointment, especially because he did it as a consequence of all his amazing work at Swansea," Mourinho told the Sun. Rodgers was appointed by Mourinho as the Chelsea youth-team manager in 2004 and was promoted to reserve-team manager two years later. He left Stamford Bridge in 2008 to become Watford boss. His appointment came after the Reds were linked with a number of candidates including former Chelsea boss Andre Villas-Boas, ex-England coach Fabio Capello and Ajax manager Frank de Boer, as well as Wigan manager Roberto Martinez, who held a meeting with the club's hierarchy. Rodgers declined an initial opportunity to speak to Liverpool about the vacancy 12 days ago before changing his mind and Mourinho believes he can make a good impression at Anfield. "Brendan is a good man, a family guy and a friend," he added. "When he joined us at Chelsea he was a young coach with lots of desire to learn. "But he was also a coach with ideas, who was ready not just to listen but also to communicate and share." Liverpool striker Craig Bellamy is happy with the decision: "I think they have made a very good appointment in Brendan Rodgers, I really do. "He is very good guy as well, speaks well, knows his football, and he has proven himself."